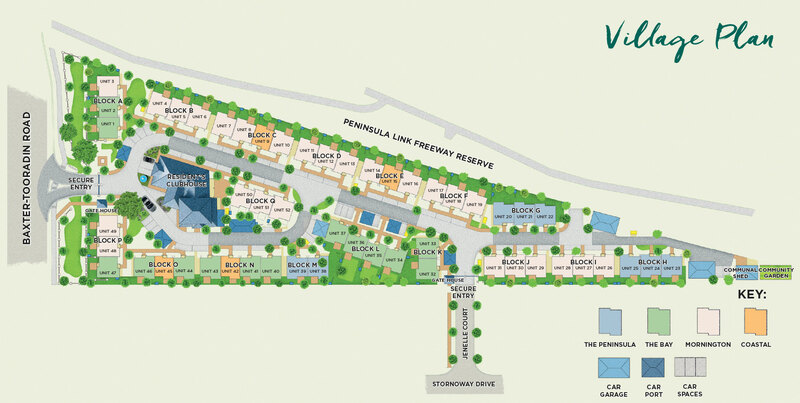 The Peninsula Lifestyle Retirement Village garden plan incorporates two significant mature gumtrees, one at the entry, the second in front of the clubhouse. The canopy of the clubhouse tree shades a naturally-draining rain garden and water treatment area. These beds feature native plantings – including Grevilleas and indigenous grasses – that help trap sediment and nutrient run-offs, minimising pollution and reducing erosion as water returns to the soil naturally. 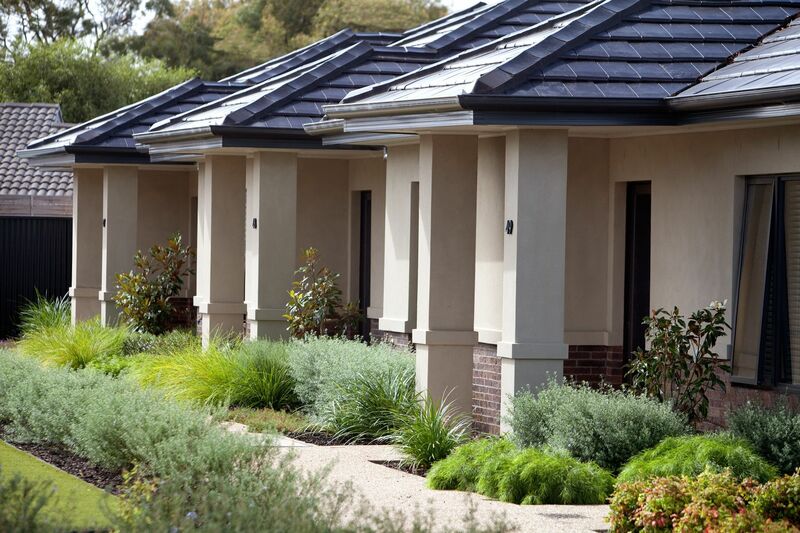 The rear gardens of individual villas feature deciduous trees offering colourful leafy canopies for shade in summer and autumn, and letting light flood into the units when the leaves fall in autumn and winter. The village boundary is screened with larger native shrubs to provide both privacy and security. Genus Landscape Design are Mornington Peninsula-based landscape architects highly skilled in creating functional and environmentally respectful garden designs. Principal Jason Davidson was instrumental in the design of Peninsula Lifestyle Retirement Village’s refreshing garden plan. He says the key to its success is a marriage between the natural elements of the site (native trees and natural water drainage channels) with a classically styled and colourful formal garden design incorporating fragrant plants known to thrive there and love the climate. A review of the site and other successful properties in the area inspired the choice of classical plantings for residents’ individual gardens as well as the overall village layout and ‘theme’. Uniform hedges, colourful garden beds, ornamental fruit trees and other deciduous tree plantings add colour and form, beautifying the village entrance and presenting an extremely comforting and luxurious ‘welcome home’ for residents. Along the footpaths, roadways and site entry, the style is formal English. Classical plantings include hedges of native rosemary and rows of ornamental deciduous trees that present clean lines and create neat entry ways and more detailed and defined garden spaces. Another hedging plant, Orange Jessamine (Murraya paniculata), will deliver a delightful springtime scent. Rows of ornamental pears will turn a deep red colour in autumn and blossom with a stunning ‘fresh white’ show in springtime. The native rosemary plantings will feature small white flowers atop deep green foliage. The white and mauve flowers of wild iris contrasting with its ‘strappy’ foliage will give texture, and Hebe ‘Inspiration’ introduces richer shades, from the dark green leaves edged in deeper plum to purple flowers. Spring and summer will bring fiery rich displays of orange and red from the Grevillea Grassfire groundcover – a wide-spreading form with deeply lobed silvery green leaves.